No introductions, just facts about what’s been going on! Go! We’ve been doing some work in AURO recently that I think is pretty interesting, and I wanted to share it with you. Firstly, the biggest thing that has been happening from a game design perspective is that the system of counters is starting to solidify and become clear. People often think about an ecology of counters – a “rock, paper, scissors” – in multiplayer strategy games. In Starcraft, for instance, Wraiths counter Guardians, and Guardians counter Marines, and Marines counter Wraiths (roughly, no arguments about this example, please!). In my experience, single-player games don’t usually have a system like this. Even in highly replayable games such as abstracts like Tetris, roguelikes like Shiren the Wanderer, or so-called 4x Strategy games like Civilization, this kind of a thing doesn’t really exist. We’ve realized something about “extra characters” for AURO‘s main gameplay mode. Namely, that we’re not going to do them. Kickstarter users – fear not! We’re still going to have extra playable characters, but we’ll be doing them a bit differently. Allow me to explain. AURO is this really tight system where each monster and ability type counter each other out. It’s kind of like this little balanced eco-system. The problem with throwing a new asymmetrical character into that ecosystem is that it inherently imbalances the system. We’ve tried a number of different character concepts and it always biases the character towards one ability type, or, if we make it so mild/uninteresting that it doesn’t, it’s just not worth doing. So that’s the thing. We could do extra characters, but only if they were so mildly different that it wouldn’t be exciting. Factor in that extra characters would still have to be balanced against AURO in order to get the same high scores, and it’s just not worth the effort. INSTEAD, what we want to do is add Character-based variants. So, on the main screen, there will be the normal game, where you play as AURO. However, there’s also a list of other gameplay modes. One mode is like, Argo’s Adventure, or something, where not only is Argo different, but the entire world eco-system is tweaked to make Argo’s gameplay as good and interesting as possible on its own. And we can add more of those. In addition to this, we can still allow other playable classes that are nothing more than a cosmetic avatar. So again, Kickstarter guys, don’t worry – your Player Class likeness is going to be playable in the main game (at least visually) and it will have a game mode devoted to it. I hope that people understand our motivations for this! (Post a comment if you don’t). Make sure to go check out our FANCY NEW FORUMS! And let us know what you think of them. Tons of art updates, like we’ve finished the logo. The game is now running mostly great on devices and we’ve got an Apple developer account set-up and ready to go. As expected, the release is probably going to get pushed back. It’s already march 10, and I’d be lying if I said that I still thought we could make the May 1 release date… but you never know. Right now I’d say tentatively by the end of May might be possible, though. Anyway, without further adieu, here’s the new logo! Go lead artist Blake Reynolds! Loving the new Logo, so hot! Can’t wait to play Auro and know more about the alternate game modes. I 100% agree with having a solid Main Game Mode while making the experience more varied through additional but distinct modes. Wish you good work with the last stretch, I can feel your pain! When you say “this kind of thing doesn’t really exist [in single player games]” are you somehow overlooking Pokémon, or am I just misunderstanding what you mean by likening “counters” to “rock, paper, scissors”? Yeah Pokemon doesn’t qualify IMO because it’s an inherently different kind of system, in that it’s persistent. So you can always just grind up and get more of whatever counter you want – you don’t have to really react during a game session… I mean, “game session” doesn’t even mean the same thing. 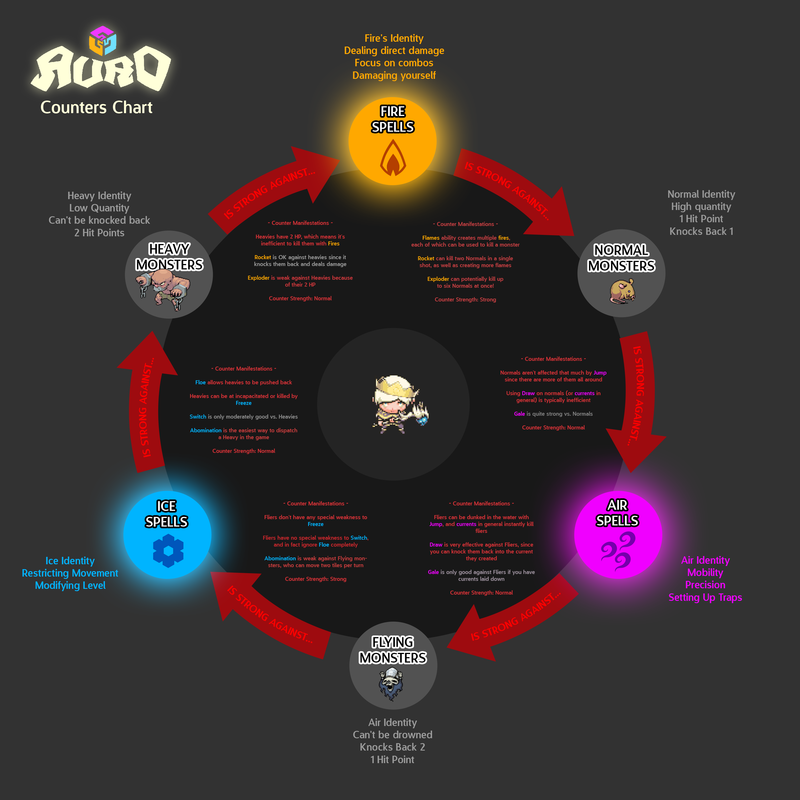 Anyway probably ALL videogames have some kind of counters-system to them, but Auro is a non-persistent competitive thing which makes it dramatically different than something like pokemon, so the context for the counters is really different.